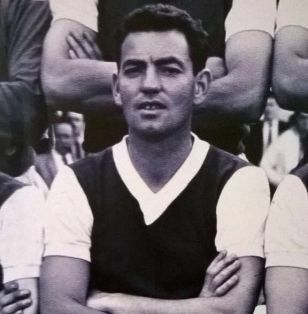 Former Hibs’ inside forward Tommy Preston has sadly passed away aged 82. He will be sadly missed by Hibs’ fans everywhere and the Edinburgh Reporter sends our condolences to Tommy’s friends and family. Tommy played for Longstone Primary School then Juniper Thistle where he won an under 18 Scottish Cup medal. He then moved to Edinburgh Thistle and Newtongrange Star before Hugh Shaw signed the youngster for Hibs. After a spell in the reserves alongside his friend Roy Erskine, the grandfather of Andy Murray, Tommy became a regular in the first team playing in a variety of roles. Tommy made his first team debut over 60 years ago on 17th April 1954 in a 3-0 defeat to Celtic at Easter Road in front of a crowd of 45,000. Among his team mates that day was three members of the Famous Five, Eddie Turnbull, Willie Ormond and Bobby Johnstone. His first goal came less than a month later against East fife in the League Cup. In 1955, along with his team mates, he made history playing against Rot Weiss Essen in the European Cup as Hibs became the first British team to play in Europe. Three years later, he played in the 1958 Scottish cup Final defeat to Clyde at Hampden Park. In total Tommy played 313 times for Hibs, scoring 50 goals including both home and away in the club’s historic Inter Cities Fairs Cup quarter-final against Barcelona. His final game in the famous green and white strip was against Aberdeen on 28th March 1964. After leaving Hibs, Tommy played with St Mirren for a year.